A dad asked how to unlock an iPad, when his son locked it until 2067. Giving a child an iPad to educate/silence them is all well and good – until the child locks the damn thing by pressing everything a million times. And in the story we’re about to tell you, we’re being conservative when we say a million. 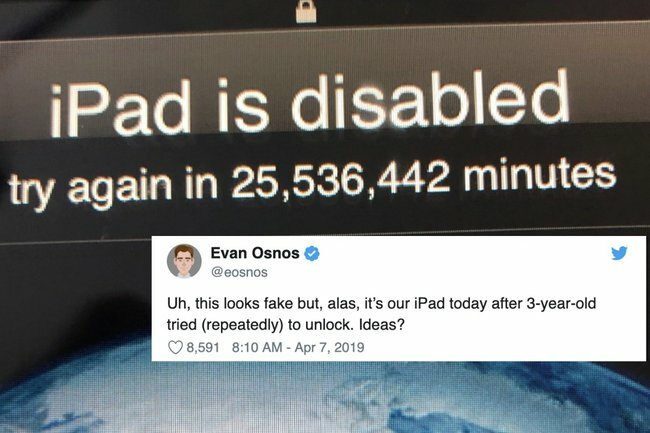 Earlier this week, American dad Evan Osnos, a staff writer at The New Yorker, tweeted that his three-year-old son had been playing with the family iPad, and managed to lock it for quite some time. You see, an iPad locks as a security feature whenever an incorrect password is repeatedly typed; and the more that happens, the longer the lockout. Frustratingly for Osnos, his son had been doing exactly that at length. Which is why the dad tweeted a screenshot of the lockout period – 25,536,442 minutes – and asked his followers for help. “Uh, this looks fake but, alas, it’s our iPad today after 3-year-old tried (repeatedly) to unlock. Ideas?” he tweeted. That’s a lot of minutes; in fact, it totals more than 48 years. Not wanting to be locked out of his device until the year 2067, Osnos was open to all suggestions about how to address the situation. But another couldn’t resist suggesting the very unhelpful – “Put it in a bag of rice” – which was only bested by the advice that “time travel seems to be your best bet”. A less child-friendly option of ‘rebooting’ the child was also offered. So, what can you actually do if you’re ever faced with such a dire situation? According to Apple, restoring the device is your best bet. You’d lose access to any data that wasn’t backed up, but at least the device could function again. A few days later, Osnos tweeted an update; he’d managed to get the iPad into DFU (Device Firmware Update) mode and the device was in the process of being restored. Yes, thanks followers – except those with advice about rebooting kids, time travel, and rice.